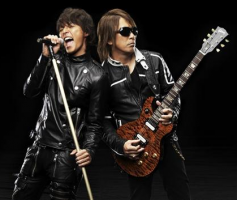 B'z is made up of guitarist-composer Tak Matsumoto and vocalist-lyricist Koshi Inaba. B'z is a Japanese rock band comprised of guitarist-composer Tak Matsumoto and vocalist-lyricist Koshi Inaba. Since their debut in 1988, B'z have remained one of the most successful music acts in not just their home country but the world, having set a number of records that still stand today. Not only have they remained at the top of the charts for over two decades, they have done so while experimenting with a great many sounds in virtually every imaginable genre of music. In addition to their work as a group, both members have complimented their musical endeavors with storied solo careers. Among the records set by B'z are the distinctions of having the most number one singles, of which all are consecutive, the most number one albums, and the most number one home video releases. Overall, B'z has sold over 35 million singles and have moved over 85 million records in total—the most ever sold in their home country. B'z currently has over thirty releases that have sold over a million copies, including their first two best-of compilations, B'z The Best "Pleasure" and B'z The Best "Treasure", that remain the second and fifth highest selling albums in Japanese music history. B'z concerts, referred to as LIVE-GYMs, have been characterized by their consistent quality, energy, and production value. In addition to playing shows all over Japan, the duo has performed live in the United States, Taiwan, Hong Kong, and Canada. In addition to their large-scale concerts, B'z also venture out to see fans in the form of SHOWCASE shows—concerts with setlists that typically include a great many scarcely-performed songs and take place at smaller, more intimate venues. Generally, they are often played as warm-ups to the larger LIVE-GYM concerts as well as a means of still touring for fans even when a major album promotion isn't in order, especially in areas of Japan that the band have not visited previously or have not visited in some time. Since December 1988, a quarterly magazine has been available to members of the band's fanclub, B'z PARTY. Be With!, previously known as Be+wiZ!, began as more of a newsletter but has since evolved into a full magazine with thorough interviews with the band in each issue, recording diaries, detailed backstage reports, exclusive reveals, and a great deal of special features. 1.5 1991: First tour including arena-class venues: B'z LIVE-GYM "Pleasure'91"
1.7 1993: First open-air concert in Nagisaen: B'z LIVE-GYM Pleasure'93 "JAP THE RIPPER"
1.8 1994: The longest tour in B'z history: B'z LIVE-GYM '94 "THE 9TH BLUES -Part1-" and B'z LIVE-GYM '94 "THE 9TH BLUES -Part2-"
1.9 1995: First stadium tour: B'z LIVE-GYM Pleasure'95 "BUZZ!!" 1.11 1997: First dome tour: B'z LIVE-GYM Pleasure'97 "FIREBALL"
1.12 1998: 10th Anniversary, first best-of compilations B'z The Best "Pleasure" and B'z The Best "Treasure"
1.17 2003: 15th anniversary, Typhoon No.15 approaches as B'z plays their 15th anniversary open-air show, B'z LIVE-GYM The Final Pleasure "IT'S SHOWTIME!!" 1.18 2004: Formation of TMG, Koshi's Debut Solo Tour, B'z Singles "BANZAI" and "ARIGATO"
The origin of "B'z" comes in various forms, though both members have stated on more than one occasion that there was no deep meaning behind its creation, with it mostly being spontaneous and spur of the moment. The most prominent explanation was that they wanted to be an "A to Z" sort of band, a band from which you could expect any sort of music. This was shortened to "A~Z" and then "A'z", but the pronunciation possibly being mistaken for "AIDS" made it an unfavorable candidate, which led to "B'z". Koshi repeated this sentiment in the 2012 documentary Only Two in a New York interview during their latest United States and Canada tour. Additionally, the band wanted a name that was easy to recognize, something modern that would lend itself well to a logo and become a recognizable namesake. The uncertainty behind the exact origin of the band's name has led to much fan and press speculation over the years. With the question being one of the most common the band have received in their decades on the music scene, a few additional and supporting explanations have also arisen. Tak mentioned in a 1989 interview that the idea of having a "Z" at the end was the result of a casual remark by a staff member, while the idea that "B'z" is associated with bees was supported when Koshi explained in an interview on TOKYO FM's "BEAT ZONE" program that the pronunciation of "B'z" was similar to "bees" in English, meaning a swarm of bees. Bee imagery would be featured during the year 1995 on the single for "love me, I love you" as well as serving as a motif for B'z LIVE-GYM Pleasure'95 "BUZZ!!". Later, Tak was also quoted as saying he liked the idea of using a "Z" in the name and thought having a "B" would be appropriately masculine, with the number of associated "B" rock artists out there. Thus, adding the two together formed "B'z". Another popular explanation that emerged in the press was that the band wanted to be inclusive of their favorite rock artists, and thus the name "B'z" included "B" for The Beatles and "Z" for Led Zeppelin. In the mid-1980s, the music scene in Japan was awash with music that consisted primarily and often exclusively of digitally-generated sounds and rarely involved the full instrumentation one would expect of rock music. The state of popular music at the time was at odds with the rock culture that a young guitarist by the name of Tak Matsumoto had admired since his youth. Then a studio musician playing guitar on the albums of some of Japan's top emerging pop acts, such as TM Network and Mari Hamada, Tak was discontent with the lack of distinctive guitar work in the music industry and longed to create his own music. After a stint of touring and recording with Hamada and TM Network, the young guitarist was determined to emerge from the shadow of being a supporting artist and create his own musical identity. One of the earliest known promotional shots of Tak and Koshi as B'z from the shoot for their original releases. After departing from his supporting commitments, Tak set out to embark on his solo career where he would have control over the sound of his music. Solo instrumental albums were seeing a niche trend within a market that was starving for some sort of innovation, and thus Tak took advantage. On May 21, 1988, Thousand Wave, the debut album from twenty-seven year old guitarist Tak Matsumoto, was released to the Japanese public. The ten track album laid the foundation for Tak's early compositional style and offered the world the very first example of the prototypical B'z sound that would be of vital importance in the years to follow. In addition to offering a taste of what would become B'z music, it was here that Tak cemented another element of B'z history when friend and keyboardist Takanobu Masuda played on over half the album. Masuda had previously served as a fellow supporting member to Mari Hamada and would go on to tour with B'z more so than any other supporting member, having done so beginning in 1992 and would still be doing so even as of 2012. The young Tak was satisfied with Thousand Wave and his first experience of being in control of the studio. At the same time, he felt he still hadn't even begun to reach his potential for what he wanted to accomplish in his musical career. As such, with the release of Thousand Wave, Tak felt that chapter of his career had ended and the next was soon to begin. It was then that he set out to realize his dream and thus began his search for others with which he could form a band to take to the top of the charts. In May 1988, Tak—feeling confident with a guitar and not so much in his vocal ability—began searching for a vocalist with which to pair himself and begin his band project with. It was at that time that a music producer and friend by the name of Daiko Nagato introduced Tak to a demo tape from his collection of aspiring artists. The tape was a recording made several years prior by a university student who had made the tape with the hopes of being noticed and becoming a professional musician. The songs from the session that were then heard by Tak were covers of T-Bone Walker's "T-Bone Shuffle", Led Zeppelin's "You Shook Me", and Billy Joel's "Honest". The tape went unnoticed and unrewarded at the time and was filed away. Years after it had been recorded, the solo guitarist Tak Matsumoto was listening to the tape and immediately sensed a connection with his style of music and the voice he was hearing. Tak and Koshi promoting their debut album on radio's SF Rock Station program on August 22, 1988. The voice on the tape belonged to a recent Yokohama National University graduate by the name of Koshi Inaba. Though he had been a student at the time the demo tape was authored, he had now graduated with a degree in mathematics and had embarked on the path of teaching the subject instead. The young Koshi had excelled at academics, particularly in English and math, and felt comfortable teaching the latter considering that, during the course of his university days, he had ranked third in the entire country in mathematics. It was not in teaching that his heart really belonged, however, and while his dreams of being a musician had begun to diminish with the responsibilities of the real world, he was not ready to give up entirely. When he suddenly received a call from a man named Tak Matsumoto to request an audition with concern to a demo he had recorded years earlier, Koshi was floored and immediately accepted the meeting. The rendezvous took place at a small studio in Roppongi, Tokyo called "SOUND JOKER". There, the two mused over the music that they liked and found a great many similarities between them, including a mutual fondness of The Beatles. The pair reconvened the next day without a solid plan and decided to become more familiar with one another's styles by playing Beatles songs together. It was then that the two played through covers of "Oh! Darling" and "Let It Be" with only a microphone and guitar. However, shortly after the second song, the guitar amplifier malfunctioned and they had no choice but to call it a day. Despite the sudden inconvenience, both Tak and Koshi had heard enough and their newfound band was on its way. Twenty years later, after they had long topped the Japanese music scene and become its biggest artists, the two relayed this story and performed "Oh! Darling" under the same conditions, with only a microphone and guitar, to a crowd of over 70,000 during their sold-out 20th anniversary tour. While the formation of the band came quite easily, Tak and Koshi said in later years that it was more of an organic than an arranged decision to start a band, with it all happening naturally. During their 1993 tour, "RUN", Tak joked on-stage that, "Come to think of it, we never did [outright agree we should form a band]", to which Koshi responded, "Let's do it then!". In the Japanese music industry at the time, the perception was that rookie artists should give up if they are unable to produce a hit within three albums. As a result, Tak said to Koshi in the early days that they should score the cover of Gb, a popular music magazine at the time, within three years. From the band's founding through writing the music, producing, and recording their original works, it all occurred in a short period of around four months. At the onset of the first album's recording, Tak oversaw all aspects of the album, including presiding over Koshi's lyrics, who had no previous professional experience with songwriting. Very quickly, he recognized his partner's natural proficiency with the art, no doubt due to his extensive vocabulary with both Japanese and English and his ability to develop thematic themes seamlessly around the music Tak had written. This was to be the true beginning of the sound that would define B'z music in the decades to come. Tak continued writing all of the music and performing all guitar while Koshi sang and wrote all of the lyrics freely. Finally, on September 21, 1988, the simultaneous releases of their self-titled debut album B'z and their first single, "Dakara Sono Te wo Hanashite", marked the beginning of a new era in the lives of Tak Matsumoto and Koshi Inaba as well as serving as the beginning of what would forever change the face and sound of Japanese music. B'z during their very first live performance on April 4, 1989. With the release of their first album, B'z had their first taste of building their own sound and developing their vision of what they wanted to accomplish in music. Their debut releases in 1988 did not make too big of a splash in the music scene, but did garner acclaim amongst those in the music community. The band were not especially concerned with the sales, however, as they had already decided they would not tour in support of the album and had a very different plan to most other new artists of the era. Their feeling was that, until they had enough material to perform a full live show, they would not be taking the stage as they wanted enough variety in their songs to give those who appeared at their shows a lasting, unique experience. The goal was to have 90 minutes of material to play a full show before going on tour, and as such, they immediately went back into the studio to write more music with the experience they had developing the first album together. The aim was to create an album with songs that would be single-worthy. However, this was also the most trying time for Koshi as a lyricist. In subsequent interviews, Koshi mentioned feeling like giving up at several points, but was encouraged by Tak who said his lyrics were getting better and better. Though a stressful recording process, one of which consumed nearly 1,000 total hours in and around the studio by some accounts, Koshi's resilience with the album's lyrics paid off. Through the album, he was able to explore lyrical themes dealing with daily life, as well as romantic relationships and endeavors as well as its place in friendships. From the sessions, the unexpected live hit "OH! GIRL" emerged: an upbeat and optimistic pop-rock number that still frequents their live setlists to this day and is arguably their most successful of their older songs. Once recording had been completed, B'z made their debut on the live stage when they appeared at the Nemu no Sato Resort for the SF Rock Station finale event entitled "Thank You TM Network". Tak had previously served as the guitarist for TM Network prior to departing for his solo career and thus he and Koshi made their first live appearance in support. Their brief setlist of five songs included their debut single "Dakara Sono Te wo Hanashite" and its B-side "Heart mo Nureru Number ~stay tonight~" as well as debut album songs "It's not a dream" and "Half Tone Lady". Most notably, their next single was debuted as their final performance of the evening and would later become known as "Kimi no Naka de Odoritai". The song, also soon to be included on their follow-up album, was a high-energy rock-dance song that showed the versatility they had been honing in the studio over their original efforts. The ten-track resulting album entitled OFF THE LOCK was released only nine months after the first on May 21, 1989. The band's second single "Kimi no Naka de Odoritai" was, as was the case with their original releases, released simultaneously. The album's title came from the idea that the work would be "removing the lock" for the band, to allow them to explore their potential as a full rock band on the live stage with nothing left holding them back. Upon release, the album debuted at number 33 on the Weekly Oricon Albums chart, ranking fifteen slots ahead of their earlier debut album. While the releases did not lead to especially great mainstream success, it did lay the foundation for their forthcoming live shows that would bring B'z to the attention of the music industry and music fans alike. It would only be a matter of months before B'z had their first major hit and were on their way to stardom. The band as seen during B'z BAD-CLUB GYM, their only tour of the type in which they toured clubs for three dates. With two complete albums in the bag, the band finally felt they would be able to confidently hit the live stage and play a full show of their own material. As such, their first live tour was scheduled: B'z LIVE-GYM 00 "OFF THE LOCK", a three-date engagement at three well-known music venues from June 1 to June 5, 1988. The brief tour was to serve to test the waters but came up with very unexpectedly positive results. The three shows, in Nagoya, Osaka, and lastly Tokyo, sold out completely on the very first day tickets were made available, despite them being for a relatively new band that had not played on tour before. The regional tour was a massive success for the newly-established band, and established many of the core components that would remain intact for B'z shows decades later, including Tak playing a solo midway through the setlist. The setlist remained the same for all three shows, with "Dakara Sono Te wo Hanashite" being reserved for the one and only song played during the encore. The success of their first major live endeavor was not one taken lightly. Immediately, Tak and Koshi returned to the studio in order to expand their catalogue with the feeling that there was more they could do beyond their second album. It was during these sessions that one of their most well-known songs, even two decades later, would emerge. The resulting mini album ran a massive 22 minutes for only three tracks and gave the band the chance to explore their depth and try new things in the studio outside of a proper album release. It was then that "BAD COMMUNICATION", the title song of the aforementioned mini album, was born. However, neither Tak nor Koshi expected the work to be a hit. The release was carried out only as an experiment in the studio, and approached as a stepping stone between their second and third albums. This free-form exploration led to their break through, with the public finally getting the chance to glimpse just what the duo were capable of on the music scene. B'z from their first major tour B'z LIVE-GYM #00 "OFF THE LOCK". During the sessions, B'z also took their first stab at English songs as well, due to Koshi's proficiency with English and their mutual admiration for Western rock music. English versions of their debut single and an earlier album song were created, under the titles of "DA.KA.RA.SO.NO.TE.O.HA.NA.SHI.TE -OFF THE LOCK STYLE-" and "OUT OF THE RAIN -OFF THE LOCK STYLE-"—the latter of which remains their longest song, at 7 minutes, 38 seconds. Additionally, B'z took the opportunity during the same sessions to simultaneously create an English version of "BAD COMMUNICATION" as well, though it would not be included on the release. When its late October 1989 release arrived, "BAD COMMUNICATION" took the Japanese music world by storm. Debuting at number 12 on the Weekly Oricon Albums chart, the ranking was a twenty-one spot improvement over OFF THE LOCK. Heavy radio play brought much attention to the band, and from there their success was cemented. At the time of release, a second tour, B'z BAD-CLUB GYM, was organized as a tour of club venues that lasted three dates from mid-to-late October. The setlist was unusual in that it began with three English songs: "Bad Communication E.Style", "DA・KA・RA・SO・NO・TE・O・HA・NA・SHI・TE -OFF THE LOCK STYLE-", and "OUT OF THE RAIN -OFF THE LOCK STYLE-". Afterward, the setlist was a mix of songs from their first two albums prior to culminating in a one-song encore of the original Japanese version of "BAD COMMUNICATION". Afterward, B'z immediately embarked on their first nationwide tour, due to increasing public demand. The tour, B'z LIVE-GYM #001 "OFF THE LOCK", saw the band performing their biggest shows to date, with a full 17-song setlist. Concurrently, a short tour entitled B'z CAMPUS-GYM "OFF THE LOCK" took place—a two-date run of college campuses and the only one of its kind in the band's history. The unexpected explosion in attention led the band to a great many more promotional opportunities than they had planned, including their first television appearance performing "BAD COMMUNICATION" on November 24, 1989 for Hit Studio Night R&N. 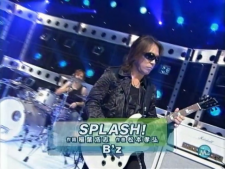 This would be the first of several early television appearances by B'z on the program, including an encore appearance just one month later on December 15 again performing the same song. Their work in 1989 propelled B'z to the national spotlight, with hits on all fronts, from albums to television to the live stage. While impressive on its own merits, it would not be until the following year that the band truly found their break through, when they began an unprecedented record, released their first home video, and undoubtedly changed the way that music in Japan was seen by the general public. 1991: First tour including arena-class venues: B'z LIVE-GYM "Pleasure'91"
1993: First open-air concert in Nagisaen: B'z LIVE-GYM Pleasure'93 "JAP THE RIPPER"
1994: The longest tour in B'z history: B'z LIVE-GYM '94 "THE 9TH BLUES -Part1-" and B'z LIVE-GYM '94 "THE 9TH BLUES -Part2-"
1995: First stadium tour: B'z LIVE-GYM Pleasure'95 "BUZZ!!" 1997: First dome tour: B'z LIVE-GYM Pleasure'97 "FIREBALL"
1998: 10th Anniversary, first best-of compilations B'z The Best "Pleasure" and B'z The Best "Treasure"
2003: 15th anniversary, Typhoon No.15 approaches as B'z plays their 15th anniversary open-air show, B'z LIVE-GYM The Final Pleasure "IT'S SHOWTIME!!" 2004: Formation of TMG, Koshi's Debut Solo Tour, B'z Singles "BANZAI" and "ARIGATO"
Hot off the previous year's multiple tours, the band began 2004 in the studio recording new material. While the year would yield no new B'z studio album, both Koshi and Tak would embark on respective solo projects that were yet unprecedented for both musicians. The year's first release, however, came in the form of home video Typhoon No.15 ~B'z LIVE-GYM The Final Pleasure "IT'S SHOWTIME!!" in Nagisaen~ on February 25, 2004. Released on DVD and VHS simultaneously, the set offered full coverage of the band's 15th anniversary concert at Nagisaen—the very site where they had previously performed their only other open-air concert: B'z LIVE-GYM Pleasure'93 "JAP THE RIPPER". The release also came bundled with the documentary The Days of Pleasure, documenting the hall tour and rehearsals leading up to the finale show on the band's anniversary, along with footage of the band recording the year's studio album BIG MACHINE. Prior to fully committing the year to solo projects, a new single entitled "BANZAI" from the earlier sessions was released on May 5, 2004. The song proved to be an immediate hit on the live stage in the years that followed, with repeated performances at various LIVE-GYMs, including 2005's "CIRCLE OF ROCK" and 2008's 25th anniversary tour GLORY DAYS. It was early in the year that Tak formed a supergroup of renowned rock musicians from Japan and North America. The group, known as TMG (Tak Matsumoto Group), was the result of an idea Tak had fostered for several years. His aspiration was to create a band that mixed his own oriental-flavored rock with the classic hard rock sound that had influenced so many generations of musicians. The Tak Matsumoto Group: Chris Frazier, Jack Blades, Tak Matsumoto, and Eric Martin. The group's music was written by Tak while the lyrics were co-written by Martin and Blades. To best accomplish that goal, Tak recruited veterans from the industry that had already had a plethora of rock hits under their belts. On vocals would be Mr. Big frontman Eric Martin who was already a household name in Japan due to the success of his own band in the country. Jack Blades from both Night Ranger and Damn Yankees joined them on bass while Brian Tichy filled in as drummer for the studio sessions. The supergroup's work process was simple and played to the strengths of its members. Tak wrote all of the music and produced the album, while Eric Martin and Jack Blades—who had long been acquainted prior to the project—wrote the band's lyrics together. The recording of the album took place in Los Angeles over the course of four months and yielded 14 songs in total. The fruits of their labors were first glimpsed by the public with the March 31 release of their debut single "OH JAPAN ~OUR TIME IS NOW~". The release was preceded by a large press conference attended by over 100 members of the Japanese press. The band would perform on television four times during the year, including one instance in which the aforementioned single was performed with Jack Blades on vocals due to Eric Martin's unavailability. Ultimately, the band's fourteen track album TMG I would be released on June 23, 2004 after having been recorded sporadically from January to May. The album debuted at number one on the Oricon Weekly Albums chart and was seen as a stellar and unique collaboration between Eastern and Western rock artists. Tak Matsumoto performing with the Tokyo Metropolitan Symphony Orchestra in 2004 as part of a special collaboration. One of Tak's most heralded efforts of the year came in the form of a special event billed as Tak Matsumoto & Tokyo Metropolitan Symphony Orchestra Special Collaboration 2004: "Hana". The three night event was held at Suntory Hall in Tokyo on July 18, 19, and 20 and generated universally positive acclaim. The shows began with the orchestra playing a rendition of Gershwin's "An American in Paris" before Tak joined them on stage for a ten song setlist that spanned his entire career, including guitar-infused orchestral renditions of classic B'z songs "LOVE PHANTOM" and "Ai no Mama ni Wagamama ni Boku wa Kimi Dake wo Kizutsukenai". Solo compositions "Koi Uta", "Hana", and a three-song medley of "SACRED FIELD~RED SUN~GO FURTHER". Each show came to an end following a lengthy standing ovation for Tak and the orchestra section. In September, the finale to the three-night event would be aired in its entirety during a television documentary on Perfection Choice. The program showed behind the scenes interviews with Tak and members of the orchestra as well as capturing the moment in which Tak gifted his signature guitar to the orchestra's conductor following the final performance. Later, on November 24, 2004, Tak's seventh solo album House Of Strings was released, featuring fourteen tracks that continued to develop the orchestra-guitar fusion that he had started with the earlier live project. Shortly after the collaboration came to an end, rehearsal began for what would be a months-long live commitment: TMG LIVE TOUR "Dodge The Bullet". The seventeen date tour immediately proved popular with fans of all the acts involved in the group and eventually culminated in a finale at the Nippon Budokan in September. For the live shows, Chris Frazier, who had previously drummed on the B'z album BIG MACHINE, joined the band on all dates. The setlist included all but one song from their debut album and three self-covers from outside the scope of the project: "BLUE", a solo played by Tak in the middle of the show from his 2002 solo album Hana; "(You Can Still) Rock in America" by Night Ranger, with Jack Blades on lead vocals; and an acoustic version of "To Be With You" by Mr. Big being played with all members collectively playing acoustic guitar and all contributing vocals. In the midst of the tour, TMG also made two appearances at the annual Japanese music festival SUMMER SONIC for the 2004 edition—a show at which Koshi Inaba was also performing for his own solo effort. The tour would be released on home video at the end of the year under the title Dodge The Bullet. Tak remained busy throughout the year, between his solo efforts, his commitment to TMG, and his continued collaboration with Koshi as B'z. In November 2004, Tak officially established "House of Strings", his own music label meant to push and promote guitarists and string musicians. Although he had released solo material in years prior and had success on the charts, none of that success was accompanied by a dedicated tour. Koshi Inaba LIVE 2004 ~en~ would soon remedy this, touring from July to September of 2004 just as Tak's TMG project would. Notably, one of the support members responsible for guitar on the tour was Yoshinobu Ohga who would later become a backing guitarist for B'z beginning in 2011. Koshi playing guitar and harmonica simultaneously during "I AM YOUR BABY" as part of Koshi Inaba LIVE 2004 ~en~. The guitar is an instrument he is seen playing often during his solo tours since. Two days prior to the tour kicking off, Koshi's third single "Wonderland" was released with three all-new tracks. Its release was accompanied by several television performances, on Music Station, HEY!HEY!HEY, Utaban, AX MUSIC TV 01, and CDTV. The single debuted at the top of the Oricon Weekly Singles chart and became the thirty-sixth highest selling single of the year. The single would feature Koshi's first collaboration with American guitarist Stevie Salas, who would be one of his most frequent collaborators in his solo works in the years to come. Alongside the tour itself, Koshi and his supporting band also appeared at two special events, beginning with a billed appearance at THE ROCK ODYSSEY 2004. The festival saw many other notable acts, including Aerosmith, The Who making their Japanese debut, and Paul Weller. This was followed a month later by an appearance at SUMMER SONIC 04, at which Tak's TMG group also performed at the sister location. Koshi was joined by other major artists on the bill, including Green Day and Sum 41. Koshi and American guitarist Stevie Salas. The pair began collaborating in 2004 and have featured in each other's works often since. Unusually, Koshi Inaba LIVE 2004 ~en~ was not carried out in conjunction with a solo album release, although three otherwise unreleased songs would be performed during the tour. This did not prove an issue, however, as Koshi's previous albums Magma and Shian in 1997 and 2002, in addition to his earlier multi-track singles "Tooku Made" and "KI", provided a great deal of variety with which to craft the setlist. The amount of songs varied between 19 to 21 throughout the tour, with a great many swaps, combinations, and alterations being made throughout to accommodate new songs. Given this was Koshi's first solo tour, many of the songs were seeing their first live performance of any sort. Two days after the tour concluded, his third solo album Peace Of Mind debuted at number one on the Oricon Weekly Albums Chart upon its September 22 release and featured fourteen tracks. As with all his solo works, Koshi wrote all of the lyrics and music himself, with the exception of the fourth track "Shoumen Shoutotsu". The music for the track was co-written with Stevie Salas, with whom Koshi would strike up a close friendship. Two years later, Salas would bring in Koshi to sing a duet on an English version of the song under the translated title "Head On Collision", which was first found on his own solo album Be What It Is. Peace Of Mind featured not only Salas but a number of international artists collaborating on its tracklist. This led to recording taking place in New York, Los Angeles, Tokyo, and Osaka. Koshi's first year as fully-committed solo artist proved immensely successful with both a number one single and a number one album cementing his status as not just the vocalist of a renowned rock band but also a capable solo artist with even more to offer as a musician. Despite their busy schedules, Tak and Koshi continued to work on B'z projects throughout the year. On September 1, 2004, their thirty-seventh single "ARIGATO" was released. The single had been recorded in May alongside "BANZAI" and likewise debuted at the top of the Oricon Weekly Singles chart. By October, the pair had returned to the studio to record what would be their next studio album and single. Although 2004 would be the only year to date in which they did not join together for a dedicated live tour, B'z did reunite for an appearance on Music Station SUPER LIVE 2004 to perform "ARIGATO" in what would prove to be its only television appearance. It would be in the following year that B'z would spend half the year on the live stage, touring for six months with what would prove to be one of their most kinetic live shows to date. After wrapping their solo projects that would make up most of their activities in 2004, B'z returned to the studio to begin writing and recording the releases that would reach the market in 2005. The first of these releases was a new upbeat single entitled "Ai no Bakudan". The song was designed to be played live, as well as be coverable by musicians of all proficiencies. Thus, for the first time, B'z included karaoke and guitar solo-less versions of the title song in limited editions of the single. This would prove to be their first karaoke release since 1996's B'z TV STYLE II Songless Version. It was not long before "Ai no Bakudan" made itself one of the band's most beloved hits, having been the subject of well over one hundred performances at almost all applicable LIVE-GYM shows by the time of the band's 25th anniversary and having only been released for eight years at that time. The song would be revived once more in 2012 when it was re-recorded in English as "Love Bomb" for the band's worldwide debut English album. The special circular stage used during B'z LIVE-GYM 2005 "CIRCLE OF ROCK". It was a first for the band and was met with wide acclaim by concert goers. On April 6, B'z released their 14th studio album entitled THE CIRCLE. During recording, the band was especially focused on creating an album of songs that would work well in a live setting. As far as personnel, Shane Gaalaas and Akihito Tokunaga again returned to perform on the record. The album's title stemmed from the collective feeling the band experienced after rejoining forces after the long break for solo projects in 2004. This feeling of "reincarnation" led to them titling the album "THE CIRCLE" as a way of signifying the return to the spirit of creating new music. Notably, the closing track was an original English song by the title of "Brighter Day". However, the song was not performed live until a worldwide stream of B'z LIVE in Namba. It was later included in other internationally-based events, such as Pepsi NEX presents B'z PREMIUM LIVE which served as a warm-up to the North American tour B'z LIVE-GYM 2012 -Into Free-. Two weeks after the release of the album, B'z embarked on their nationwide tour B'z LIVE-GYM 2005 "CIRCLE OF ROCK". The LIVE-GYM was especially noteworthy for featuring a symbolic rotating circular stage at the center of the arena and dome venues on which the band performed with the crowd encircling them. The tour began on April 17 and ran through September 19, finishing with a three night showing at Osaka Dome. The forty-one show tour began with a hall performance at Kushiro Civic Cultural Hall before proceeding to arena venues and then domes. As is customary for the band, a warm-up show, B'z SHOWCASE 2005 "Abashiri Extra Edition", was performed two days prior to the tour proper kicking off. Among the album songs from THE CIRCLE included in the setlists, a number of past singles also returned for the occasion, including "ALONE", "Konya Tsuki no Mieru Oka ni", and "IT'S SHOWTIME!!". In addition to the more distinguished songs, '90s B-sides "Mannequin Village" and "Kanashiki dreamer". The tour originally went unreleased on home video. Shortly thereafter, excerpted performances began to appear as bonus footage on various releases. The special iTunes download codes included in limited edition copies of B'z The Best "Pleasure II" at the end of the year featured a performance of "OCEAN", while the summer 2006 release of single "SPLASH!" featured color-coded releases with one performance each of "Fever", "Pulse", and "Ai no Bakudan". A performance of "Samayoeru Aoi Dangan" from the arena portion of the tour was included in the 2008 bonus disc for B'z The Best "ULTRA Pleasure". Likewise in 2008, the special video compilation B'z LIVE-GYM Hidden Pleasure ~Typhoon No.20~ featured performances of "BANZAI", "ultra soul", and "juice". The full show of the tour finale was at last released as B'z LIVE-GYM 2005 -CIRCLE OF ROCK- on DVD in February 2013 as part of the band's 25th anniversary campaign. The band during the "OCEAN" music video which was filmed at sea with the aid of the Japan Coast Guard. It would be the first time since a request was granted. On August 1, B'z made their debut on the Japanese iTunes service with The Complete B'z. The collection contained the band's first thirty-nine singles, including "OCEAN", fourteen studio albums, five mini albums, four compilation albums, and six bonus tracks there were never released elsewhere and were only available by purchasing the full set for 18,880 yen. The first of the six was a Japanese cover of the Maroon 5 single "This Love". The other five were live audio recordings of "RUN", "LOVE IS DEAD", "F・E・A・R", "ultra soul", and "Brotherhood" from a selection of previously-unreleased LIVE-GYM shows. For the arena leg of "CIRCLE OF ROCK", a new and unreleased song entitled "OCEAN" was premiered in the encore. This would be one of several occasions in which B'z premiered a song live before its release. The song would become available as a single on August 10 and was the band's thirty-fifth consecutive single to reach the number-one spot on the charts. The uplifting and soulful ballad would prove to be one of the band's most popular songs of the sort, with a great many performances to follow during numerous tours. The music video received considerable acclaim and was filmed at sea atop a Japan Coast Guard helicarrier. A shot of the B'z The Best "Pleasure II" Christmas decorations outside of the Meridien Grand Pacific Hotel in Tokyo displayed from November 24, 2004 to January 9, 2006. The year was an unusually prolific one for the band in regards to television appearances. The sole single from THE CIRCLE, "Ai no Bakudan", was performed on nine different television shows throughout the year with the first coming on HEY!HEY!HEY on February 28. The band made further appearances on CDTV, Music Station, MUSIC FIGHTER, and TV Minna. A March 26 broadcast on Fuji TV brought a special B'z episode of Our Music, which featured a full-length special retrospective interview with Tak Matsumoto and Koshi Inaba interspliced with performances of 1995's "love me, I love you", the recent single, and "Fever". In December, B'z closed the year on the annual Music Station SUPER LIVE 2005 special where they were the keynote artists, performing both "OCEAN" and the Christmas classic "Itsuka no Merry Christmas". Despite his extremely busy schedule, Tak also managed to add one more solo album to his catalogue before the year was out. On October 29, he released Theatre Of Strings under his newly-founded House of Strings label. The album was a four-man collaboration between himself and three other noted guitarists: Michiya Haruhata, Takashi Masuzaki, and Yoshinobu Ohga. The album featured the four covering well-known pieces from the history of cinema with guitar-led arrangements, including "Over the Rainbow", "The Godfather (Waltz~Love Theme)", "Mission Impossible Theme", "Top Gun Anthem", and "When You Wish Upon a Star". On November 30, B'z closed out the year by releasing B'z The Best "Pleasure II", a follow-up to their wildly successful tenth anniversary album B'z The Best "Pleasure" from 1998. The album collected all of the singles released since the original hit shelves and included the then-recently released single "OCEAN" as the opening track. In addition to fourteen more number-one singles, a special up-tempo version of "Itsuka no Merry Christmas" was included as well. With the dawn of the new year came word that B'z The Best "Pleasure II" had already sold over one million copies since its release at the end of November 2005. The band would soon begin a new chapter in its live shows, with the addition of several new staff members behind the scenes in order to push the band into a new era with as fresh a perspective as possible. On January 25, the band would release its fortieth single, "Shoudou". Shortly before it made its way to shelves, the title song began serving as the opening theme to the Detective Conan anime series. B'z would make a great deal of television appearances in the year 2006, beginning with a performance of their then most recent single on MUSIC FIGHTER five days prior to its release. A couple of weeks later, the B-side "Kesshou" would be performed on Utawara HOT Hit 10. Aside from this appearance, the song has never been played live. Upon release, the single ranked at number one and became the band's thirty-sixth consecutive to do so. Tak during the band's appearance on Music Station performing "SPLASH!". In comparison to other Japanese artists, B'z have made few TV appearances in their history, but made several during 2006. The year would prove to be one in which B'z were frequently requested to utilize their prowess for the benefit of younger artists. In March, the single "Real Face" by Japanese pop group KAT-TUN, for which Tak Matsumoto wrote the music, was released. The single would go on to sell over one million copies the year of its release and would be the highest seller of the year. An album titled Best of KAT-TUN released the same month featured a rock-centric reversion of the song titled "Real Face #1", for which the arrangement was also credited to Tak and longtime B'z support member Akihito Tokunaga. At the end of March, B'z appeared on Music Station to perform their upcoming single "Yuruginai Mono Hitotsu". The song had been announced previously as being the theme to the upcoming anime film Detective Conan: The Private-Eyes' Requiem. The single again ranked at the top of the Oricon Weekly Singles chart at release, giving B'z their thirty-seventh consecutive number-one. Shortly there after, in April, Being GIZA artist Aya Kamiki—who had grown up as a B'z fan and had performed covers of various B'z songs in her live shows as both an amateur and professional—would release the single "Pierrot" as her major label debut. The song had been written for her by Tak and Koshi, who would also release their own version the same day as the B-side to their aforementioned single "Yuruginai Mono Hitotsu". The B'z version has a straight rock edge to it, while the Kamiki version has a slightly more punk feel. Kamiki's edition of the song was arranged by Takeshi Hayama, who had previously collaborated with Tak on three tracks of his 1992 solo album Wanna Go Home. The band's forty-second single, "SPLASH! ", would become one of their most successful singles. The title song was of an entirely different sound, with the extremely fast pace of the song being comparable to a rap tune but enveloped in a rock wrapper. The release was issued in four different versions: a red CD edition, and yellow, blue, and green versions that also included a bonus DVD for each. Each DVD contained one performance excerpted from the then-recent B'z LIVE-GYM 2005 "CIRCLE OF ROCK". This would be the only footage released from the tour until 2008's B'z LIVE-GYM Hidden Pleasure ~Typhoon No.20~ sampled more from the show and 2013 saw a full home video release of the tour. So successful was the single that it was considered sold out even before its actual release date, with eventual first week sales in excess of 270,000 physical copies. B'z would promote the single with June 5 and June 9 performances on POPJAM DX and Music Station, respectively. Koshi running around Tokyo Dome at the close of "MONSTER'S GARAGE" during "RUN". The show's setlist included several other fan-favorites such as "BAD COMMUNICATION" and "Brotherhood". Three weeks later, the band released its fifteenth studio album, MONSTER. The album contained all three of the year's singles, with the first collected in remix form as "Shoudou ~MONSTER MiX~", which made the guitar a little more prominent in parts and also changed the levels on the backing vocals. The 2005 hit single "OCEAN" became the closing track under the new title of "OCEAN ~2006 MiX~", which altered the levels and balance in a way that was more favorable to the guitar work on the track over the rest of the arrangement. The mixing for the album was done by Jay Baumgardner, who had previously worked with Evanescence and Linkin Park. Baumgardner owned NRG Recordings in Los Angeles where B'z recorded Brotherhood, which is also where this album was recorded. One track from the album, "Happy Birthday", is found here for the first time despite having been premiered live in a slightly different form in the 2005 tour. MONSTER would be yet another number one album for the band, having ranked at the top of both the Oricon Weekly Albums and Monthly Albums charts upon release. Shortly after its release, the band embarked on what would be a reboot of their live shows: B'z LIVE-GYM 2006 "MONSTER'S GARAGE". Tak stated that the band had decided to push themselves in a new direction and thus involved a great deal of new talent behind the scenes to evolve their live shows in a way they had not before. As such famed architect Mark Fisher was enlisted to provide the stage design for the titular "MONSTER". Fisher had previously worked with the Rolling Stones, Pink Floyd, and U2 on some of their most memorable concerts and would prove a natural collaborator for B'z. Fisher recounted in the 2006 documentary OFF LIMITS ~How Two Men Made A Monster~ that he "wanted the 'MONSTER' to be like an animal, like a fantasy. Kind of a cross between a nightmare and a real thing." B'z during the LIVE in Namba show that was streamed live all over the world. This was their third show to be streamed after 2002's "Rock n' California Roll" and 2003's "BANZAI IN NORTH AMERICA". The tour would be one of the band's most well-known, with a base setlist that perfectly melded showings of their classics with stellar and memorable performances of the band's newer efforts. The year's leadoff single "Shoudou" was paired into a medley with the previous year's single "Ai no Bakudan", while new-met-old when "BAD COMMUNICATION" and "ultra soul" were given a similar treatment. The setlist included a great many other recognizable songs from the band, including "girigiri chop", "Brotherhood", "LOVE PHANTOM", "OCEAN", and "juice" on top of songs released during the year. Ultimately, the band would spend all of July and August on tour, with eleven dome showings including at Tokyo Dome, Osaka Dome, and the Fukuoka Yahoo! JAPAN Dome. Over 450,000 audience members attended the tour's various shows, making it a massive and nearly unparalleled success for the year. One month after the close of the tour, B'z returned to the live stage for what was originally billed as Network LIVE in Japan Supported by dwango: B'z Premium Live. The special concert was streamed all over the world by Los Angeles-based tech firm Network LIVE, who had chosen B'z as the first Asian artists to act as participants. The setlist to the show was similar to that of "MONSTER'S GARAGE", but with the addition of four English songs being performed: 1996 single "Real Thing Shakes", 2002's "DEVIL", 2005's "Brighter Day" which saw its debut live performance, and an all-new English version of "HOME" that would not be released until the following year on the band's first international EP. The show would eventually make its way to DVD in 2008 as B'z LIVE in Namba, with the title being a reference to the Namba district of Osaka where the show took place. It would later be released in 2010 on Blu-ray paired with B'z SHOWCASE 2007 -19- at Zepp Tokyo. Koshi visiting B'z Treasure Land during the "MONSTER'S GARAGE" tour. The exhibition was open to fans outside the venue and contained props, costumes, and memorabilia preserved from past shows. Interestingly, B'z would make further appearances on television outside of their typical tour and promotional schedule. Months after "MONSTER'S GARAGE" closed, B'z appeared on C20 to perform MONSTER album opener "ALL-OUT ATTACK". A further appearance one month later on 130 Million People Choose! Best Artist 2006 to perform fellow album song "Netemo Sametemo". Lastly, Music Station SUPER LIVE 2006 would air at the end of the year with B'z being one of the featured artists, performing "Shoudou" for the third time on television for the year. While most of 2006 was spent on B'z activities, some time near the end of the year was spent on solo projects. Koshi, particularly, was involved in a number of collaborations, including writing the music and lyrics to the song "Sha la la -Ayakashi NIGHT-" for fellow Being GIZA artist Saeka Uura. It would be featured in the anime series Kekkashi beginning in October. Additionally, a brief ending song was provided with Koshi as the sole performer. The song, "Akai Ito", would not be released in full until Koshi's 2010 solo album Hadou hit shelves. During dome stops on the tour, a special exhibit known as "B'z Treasure Land" was made available to the public outside the venue. The exhibit was designed as a tour throughout the band's history, with various props, costumes, and memorabilia from their history on display in an environment reminiscent of a museum. Koshi joked in the OFF LIMITS documentary that he would have to do his best during the show, in order to "make sure that people don't say they enjoyed 'Treasure Land' the most after the LIVE-GYM—otherwise, there might be people going, 'At least Treasure Land was awesome!'". The year came to an end with the DVD release of B'z LIVE-GYM 2006 "MONSTER'S GARAGE". The filming was directed by Lionel Coleman, who had previously headed up various music videos for the band. The video would later make its way to Blu-ray in December of 2010. The year proved a considerably busy one for B'z, with the release of three new singles, a full studio album, an internet-streamed concert, a full-scale tour, and numerous side projects to keep themselves busy. The foundation laid throughout the year would leave a lasting impact on the band and inform their approach going forward as a timeless rock act that was still willing to innovate in order to remain their home country's most celebrated band. Following the immense success that was the rebooted 2006 LIVE-GYM—one that would set the tone for all B'z shows that followed—and its accompanying album, expectations were high in 2007. It was already presumed the band would have big plans for 2008 given it was their twentieth anniversary year, but what would precede it was still relatively unknown at the time. Fans speculated that the previous year's live premiere of the English verison of "HOME" would possibly see a release in some form, but it was not there that the year began. Instead, the first sighting of B'z activity was the announcement of their first international tie-in. The PlayStation 2 racing video game Burnout Dominator was released worldwide in March and featured an all-new B'z song in every territory entitled "FRICTION". The song was included as a means of promoting the game primarily in Japan, but it would later be included the next year in the sequel game Burnout Paradise that was likewise released globally. The song was also published worldwide on iTunes at the same time as part of the soundtrack. The international EP released in Western countries on iTunes contained five tracks in versions unavailable in Japan and is now no longer available. It was shortly thereafter that B'z made their proper international debut on the digital platform when the self-titled B'z EP was released to virtually every western storefront on iTunes yet was not made available in Japan. Although the release was aimed at an international audience, only two of its five tracks were in English: the aforementioned English version of "Home" and the 2005 THE CIRCLE album closer "Brighter Day"—one of their select few English songs with no Japanese exemplar. The album contained highly-desired versions of three popular B'z singles: a remix of "Ai no Bakudan", a re-recording of "ultra soul" that most resembled its more recent rock-oriented LIVE-GYM incarnations, and an overhauled reversion of "Samayoeru Aoi Dangan" that featured an entirely new arrangement that would serve as the basis for 2012's English edition "Into Free -Dangan-". While this provided insight into the band's work in the early months of 2007, it was not yet known what form the rest of the year's releases would take. This was answered shortly thereafter with the announcement of their forty-third single: sentimental power ballad "Eien no Tsubasa". The song was paired with B-side "Lonely Stars" and remains one of the few times in which music videos were produced for all tracks on a single, with the latter's being a short version. In the lead-up to its release, B'z embarked on one of their busiest years with regard to television, with five appearances in the week of its release on programs such as MUSIC FIGHTER (twice—once for the title song and once for the B-side), CDTV, and Music Station. B'z also held their first interview for a news program to promote the single, with a live appearance on NEWS ZERO. "Eien no Tsubasa" was written as the theme to a World War II movie about kamikaze pilots and the families they left behind released internationally as For Those We Love. During the appearance, it was revealed that it was after visiting some of the memorial sites in the town of Chiran in Kagoshima that Tak developed an image derived from the clear and calm blue sky that inspired the melody and music. Tak would again take inspiration from that image for "hotalu" as part of his 2010 collaboration with Larry Carlton on TAKE YOUR PICK and once more in the instrumental "THE WINGS" on his 2012 solo album Strings Of My Soul. Notably, B'z would return to visit Chiran during a LIVE-GYM stop in nearby Amami Oshima for LIVE-GYM 2008 "ACTION", which included "Eien no Tsubasa" in the setlist. The band debuting "SUPER LOVE SONG" during B'z SHOWCASE 2007 -19-. In 1996, the band began their tradition of SHOWCASE events that typically played venues and areas that would not be included in wider LIVE-GYM tours. Here, in 2007, the band took the concept in a new direction. Beginning in June, B'z embarked on SHOWCASE 2007 -19- in which the band ran the gamut of Zepp venues in Sapporo, Sendai, Tokyo, Fukuoka, Osaka, and Nagoya. As is now common for the events, B'z played a number of gems and obscure songs for the tour, including "HOT FASHION -Ryuukoukata-" for the first time in 14 years, "ARIGATO" for the first time not on TV, "The Wild Wind", "Naite Naite Nakiyandara", and "Haru", as well as "Out Of Control" and "Odekake Shimasho" for the first time since the mid-1990s. The show at Zepp Tokyo would be released on DVD in 2008 and on Blu-ray in 2009. B'z becoming the first Asian artists to be inducted to Hollywood's RockWalk on November 19, 2007. The concept was broadened and expanded into yet another of its kind, the aptly-named B'z SHOWCASE 2007 -B'z In Your Town- which toured smaller areas of Japan throughout July and August. Further fan favorites were added on varying dates including "The Loose", 2001 B-side "ROCK MAN", the return of 1998 single "HOME", the live debut of "BANZAI" B-side "Magnolia", and even GREEN album ender "GO★FIGHT★WIN". None of the shows were released in full, though select moments were highlighted on the 2008 "Official Bootleg". This would also mark the first year at which B'z performed at a music festival when they were announced as one of the headline acts for SUMMER SONIC 07. The abbreviated setlist was akin to the summer's earlier SHOWCASE tours and opened with the as-yet-unreleased "SUPER LOVE SONG" and included "FRICTION" amongst some of their live staples such as "ultra soul" and "Ai no Bakudan". Shortly thereafter, B'z soon announced the year's second and overall their forty-fourth single in the oft-previewed "SUPER LOVE SONG". The third of its three tracks would be the aforementioned "FRICTION" as it appeared in Burnout Dominator. The title song was a great challenge initially and was not intended as a single. It was originally a much slower, ballad-like composition. It wasn't until months later when they returned to Japan that they reworked the song to its eventual state. In September, it was announced that B'z would become the first Asian artists to be inducted to Hollywood's RockWalk, joining the likes of Elvis Presley, AC/DC, Aerosmith, Queen, Jimi Hendrix, and John Lennon. Many of the band's longtime support members were in attendance including Stevie Salas, Juan Alderete, Shane Gaalaas, and Steve Vai who ushered in the duo's nomination. The induction was a widely-reported news item in Japanese newspapers and television. The ceremony took place on November 19, 2007 and saw the band deliver messages of gratitude in both English and Japanese. At the ceremony, B'z live footage from previous years was shown alongside samples of songs from their upcoming album which had been set for release just weeks later. As announced, ACTION was released on December 5, 2007 and debuted at the top of the Weekly Oricon Albums chart. In an interview with JAPAN COUNTDOWN, the band described the initial difficulty of writing and recording the album. Tak stated frankly: "We had a slump unlike anything before," while Koshi added that they made "light" the theme as they pressed on with it. One song, "Koubou"—literally "Ray of Light"—specifically emblematizes as much. Tak recounted that he started to dread going into the studio because the initial sessions were not at all amounting to what they expected. To overcome the slump, Koshi noted in the interview that they "started doing music with a different feel to it, and that went well" which led to them returning to their usual "recording rhythm". As a result, the album contains a large number of upbeat tracks that deal with a great variance of themes and topics such as the lively "HOMETOWN BOYS' MARCH" and the sentimental "Boku ni wa Kimi ga Iru". The album ended with the Ending SE from the previous year's LIVE-GYM, "BUDDY", which had its lyrics significantly overhauled. While 2007 would prove a landmark year for B'z in many respects and no doubt also a busy one, it would merely serve as preparation for what was to come immediately thereafter. Just months later, the band would begin a tour that would canvas all of Japan and culminate in one of their most fondly-regarded shows to date to celebrate their, to that point, most pivotal anniversary. B'z during their 25th anniversary concert at Nissan Stadium on September 21, 2013. Hot on the heels of their 2012 foray into North America, B'z began the new year with the triad of home videos announced in November 2013 that would serve to begin their 25th anniversary campaign. Accordingly, B'z LIVE-GYM 2008 -ACTION- was released in January, B'z LIVE-GYM 2005 -CIRCLE OF ROCK- in February, and finally B'z LIVE-GYM 2001 -ELEVEN- in March. Previous interviews in Be With! hinted for months what fans already knew: a 25th anniversary tour would commence sometime in 2013, but the exact timing, extent, and form it would take would go unknown in the year's early months. As had been the case with earlier anniversaries, a compilation album was expected sometime in the year to commemorate the band's twenty-five years on the music scene. The band's 25th anniversary XXV compilations included DVDs featuring all of the singles' music videos to date for the very first time. Finally, in late March, all silence was broken and the band's full anniversary plans were announced. Instead of one new compilation, fans were treated to two collections that, for the first time, set out to gather together all 50 singles and came in the form of B'z The Best XXV 1988-1998 and B'z The Best XXV 1999-2012. The two compilations also contained four brand new songs between them, with the limited edition copies coming with, for the first time, all of the associated music videos on home video. Additionally, B'z LIVE-GYM Pleasure 2013 -ENDLESS SUMMER- was at last announced: a full-blown tour that would tour halls throughout Japan from June to July, and then take on the nation's biggest domes from August all the way through their September 21 and 22 anniversary shows at B'z favorite Nissan Stadium. B'z and Aerosmith as they performed together for the second time in history, playing a joint version of Aerosmith's classic "Mama Kin" to a sold-out crowd at AEROSONIC. In April, the band were announced for a double-headlining gig with Aerosmith—their second occasion joining forces following the 2002 FIFA World Cup International Day Concert eleven years earlier. Set for August 8, the event was dubbed AEROSONIC and was to take place as the opening event for the year's annual SUMMER SONIC music festival. When the show came, the two bands each performed full sets, with B'z also joining Aerosmith on stage for a rendition of their classic rocker "Mama Kin". The band rounded out 2013 with plenty of performances, including a showing on Music Station during a "B'z 25th Anniversary Special" that featured an unprecedented four performances from B'z alone, with three coming as a result of fan requests. The show began with a B'z performance of new song "Q&A" and was followed by "LOVE PHANTOM", "Hadashi no Megami"—itself receiving its television debut—and finally "ultra soul" as the top vote-getter. A special YouTube program featuring an hour long interview with Tak and Koshi was also later aired live, featuring the band answering in-depth questions from fans that had been gathered in the weeks prior. In November, B'z appeared as the inaugural performers for a special show at EX THEATER ROPPONGI. Shortly thereafter, news came down that B'z would be releasing the home video for the year's tour early in 2014 entitled B'z LIVE-GYM Pleasure 2013 ENDLESS SUMMER -XXV BEST-. The package was announced to come in a standard package and a complete edition, the latter of which features nearly six hours of footage between the tour finale at Nissan Stadium and the special hall tour finale earlier in the tour, as well as a documentary documenting the full 25th anniversary year. The year ended on the news that PLAYER magazine's annual year-end Readers' Poll found Japanese music fans ranking B'z as Best Artist, Best Live Performance, Koshi Inaba as Best Vocalist, Tak Matsumoto as Best Guitarist, Shane Gaalaas as Best Drummer, Barry Sparks as Best Bassist, and Takanobu Masuda as Best Other Musician. A shot from Koshi Inaba LIVE 2014 ~en-ball~ during the performance of "Nensho". As depicted in the image, the show utilized a special 3D projection mapping apparatus around Koshi as he performed. The B'z activities for the year began with the home video release B'z LIVE-GYM Pleasure 2013 ENDLESS SUMMER -XXV BEST-. Released on both DVD and Blu-ray in two editions, the release spanned from three to six hours of footage covering the entire breadth of the tour. As the release loomed, however, Tak and Koshi spared no time for relaxation and instead headed to the studio to work on their respective solo projects. Earlier, on January 1, it was confirmed that Tak Matsumoto would be holding an as-yet untitled solo tour—his first true solo dates—and would be releasing a new solo album in the coming months. Tickets went on sale March 15, 2014 for the tour that ran from May 10 to June 15. Later, on February 19, an untitled song that would later be revealed to be "New Horizon" premiered as the theme to two commercials for transportation company Sagawa's latest interest promotions. Three days later, Tak Matsumoto's solo album was given a title of New Horizon and a release date of April 30, 2014. The album, produced by Tak and Strings Of My Soul collaborator Paul Brown, featured a wide range of tracks including another cover of jazz classic "Take 5"—a song Tak had first covered on his first solo album Thousand Wave in 1988. The album, like its predecessor, again featured a vocal song in "Feel like a woman tonite" which this time sported vocals from American soul singer Wendy Moten. Tak Matsumoto during his first solo live tour. It was his first tour since his 2010 collaboration tour with Larry Carlton. Several new songs were joined by "Rain", a composition first heard as Tak's solo during the 25th anniversary B'z tour, and a re-recording of his 2003 composition "BLACK JACK" for the anime of the same name. On the same day, it was announced that Koshi Inaba would be launching his first official website entitled "en-zine" would be launched the following week. Most surprising was the news that, along with the site's launch, Koshi was releasing a new digital single available immediately. The song, "Nensho", was a hard rock song that became available on the Japanese iTunes and numerous other online music outlets. Additionally, all of Koshi's past music videos—along with a new one for "Nensho"—were added to the Official B'z YouTube channel in full. The breadth of information on the site was just beginning as Koshi's solo tour for the year, Koshi Inaba LIVE 2014 ~en-ball~, was also announced with the launch. The tour, scheduled to take place over ten dates from June 5 to June 20, was set to be played at a single venue: the Shinagawa Stellar Ball in Tokyo. On March 4, another new song from Koshi's forthcoming album entitled "oh my love" was revealed as the theme to an Olympus camera commercial that began airing that day. Koshi and the band on the May 23 edition of Music Station performing "oh my love". It was his first performance on television since September 2004. Koshi continued the en-zine monthly updates with the release of another digital exclusive single, "Nakinagara", on the end of March. Support members for the upcoming tour were also announced at the time, which featured the return of bassist Corey McCormick from Koshi Inaba LIVE 2010 ~enII~ and keyboardist Kousuke Ooshima who toured with B'z during their 1998 tour. Newcomer SATOKO would handle drums, while Duran and JUON would be on guitar. A promotional blitz for New Horizon began in a litany of magazine and radio interviews in mid April. A special campaign was announced for purchasers of the upcoming album, in which 300 buyers would have the chance to win a special vinyl edition of the album. At the same time, the title "New Horizon" was featured in a dedicated commercial for the album itself that showcased its tracklist and release date. One week later, another commercial in the same vein played out with "Rain" as the theme. On April 21, the title and release date for Koshi Inaba's latest solo album were released. The work, entitled Singing Bird, would be released on May 21 and would feature twelve tracks total. A special DVD edition of the album contained four new music videos as well. At the same time, another digital single entitled "Stay Free" was released alongside a special music video for the song. The video featured Koshi on an MV Agusta -75 motorcycle customized by a California based workshop run by Shinya Kimura. Tak performing #1090 [Sen Mu Ichiya] on Music Station. The original version of the song has been serving as the theme to the popular program since 1992. Due to the demand for his upcoming tour far exceeding the amount of available tickets, it was announced that the tour finale would be screened live at theaters across Japan. An American edition of the Tak Matsumoto album New Horizon was announced in April for a July release, though this date was later moved to September and has since been delayed. In early May, the tour goods for Tak Matsumoto LIVE 2014 -New Horizon- were revealed. Tak soon thereafter played his first shows on the tour, which included several of his older classics and many of the songs from the new album in the doubleheader show. The same day, a commercial for Singing Bird featuring footage from the music video for "oh my love" began airing. Promotional image issued prior to the announcement of 2015's EPIC DAY and 51st single "Uchouten". Both Tak and Koshi would individually perform on their preferred television destination of Music Station on different dates. Koshi appeared on the May 23 edition and performed "oh my love" while Tak joined the show on June 6 to play "New Horizon" and a rendition of "#1090 ~Thousand Dreams~" which has been the theme of the music show since 1992. The first of a series of filmed discussions Koshi had with people he admired in various fields began when a lengthy talk with Japanese UFC fighter Masaharu Fukuyama was uploaded to the en-zine site. A later talk with LOUDNESS' vocalist Minoru Niihara would feature a brief excerpt of the 2013 cover of their song "Crazy Nights" that came in the passing of their drummer and friend of both B'z members. Koshi's ~en-ball~ saw him playing over thirty of his solo songs, making for quite a varied show over the limited ten date engagement. In the final development of the solo year, Koshi released a music video featuring footage from his recent tour over a new digital exclusive single that had not been on the album, "Saturday", that had served as the Ending SE to the tour. By the end of the year, neither of the members' solo shows were released on home video. By August, the band had reconvened in order to begin recording their next single and album. In October, the dates for the first half of B'z LIVE-GYM 2015 were revealed, with the tour set to begin in March. Two new songs from their labors were revealed weeks later in November, titled "Exit To The Sun" and "NO EXCUSE". The former was used as the theme song to the drama series Dark Suit, while the latter served as the theme to a Smirnoff Ice commercial in Japan beginning in late November. On December 3, the band's first single since 2012's "GO FOR IT, BABY -Kioku no Sanmyaku-", titled "Uchouten", was announced to be released one month later on January 14, 2015, and would come with "Endless Summer" as a B-side. The single was also revealed to have nine songs from the 2013 special performance B'z Special LIVE at EX THEATER ROPPONGI included on the limited edition DVD. At the same time, the band's upcoming LIVE-GYM tour was revealed as B'z LIVE-GYM 2015 -EPIC NIGHT-. As one of the most celebrated music acts in Japanese music history, B'z have sold more singles, albums, and home videos than any other band or artist. Most prominent of their sales achievements has been their unprecedented streak of number one singles. Since the release of 1990's "Taiyou no Komachi Angel", every single released by the band has debuted at the top of the Oricon Weekly Singles chart. This has resulted in a total of forty-seven singles consecutively debuting at number one. Those singles have spent a total sixty-four weeks at the top spot, which has become another record held by the band. Ultimately, the band also hold the record of longest consecutive period releasing a single at number one at over twenty years. The band also have forty-eight singles that have entered the top ten, ranking them third in the category. B'z also have fifteen singles that have sold over 1,000,000 copies, thirty of which were released consecutively. On March 26, 2003, B'z remastered and re-released ten of their earliest singles along with their then-latest single, "IT'S SHOWTIME!!". On the daily chart at launch, B'z held a monopoly over the chart's top eleven slots, with the new single ranking at the top and the re-issues covering the remaining ten. Ultimately, B'z would set a record that week for holding nine of the Top 10 slots for the week of release. To date, B'z have moved over 46,000,000 albums, ranking them at number one. In 2007, Guinness World Records added B'z as the "Artist with Most Albums Sold in Japan" with a total of 42,000,000 units sold at the of publication. In all, the band have nineteen million-selling albums, eight of which did so consecutively, and have release an unprecedented twenty-six number one albums. In all, B'z have sold over 81,500,000 albums and singles combined in Japan alone. The band are also the only act to lead all six major categories tracked by Oricon. In terms of home videos, B'z are likewise at the top of the medium with the most releases to finish at the top of the year-end chart. Several releases have topped the overall home video charts as well, outside of the music home video chart. The millions of sales of home videos, albums, singles, multiple consecutive sold-out tours have routinely landed B'z on the list of the highest-grossing music act in Japan. B'z have been a fixture at the Japan Gold Disc Show with multiple wins for Best Artist, Best Single, Best Song, Album of the Year, Best Home Video, and more. 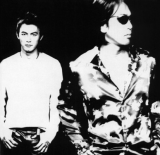 In 1999, the band were featured as the Best Selling Japanese Artist of the Year at the World Music Awards as a result of B'z The Best "Treasure" and B'z The Best "Pleasure". B'z were busy with their upcoming tour and could not attend at person, but an English video message from the band was played during the broadcast explaining their absence. Two of their highest profile achievements began in 2007 when B'z were inducted into the RockWalk of Fame in Hollywood, California. At the suggestion of fellow inductee Steve Vai, the duo were part of a live and elaborate ceremony in which their handprints were added to to the walk. Later, in 2010, Tak Matsumoto became the first Japanese guitarist to win a Grammy Award when he and Larry Carlton won Best Pop Instrumental Album honors for TAKE YOUR PICK. The band's success has led them to receive accolades and acknowledgment far outside of Japan. In 2002, American rock icons Aerosmith were invited to headline the International Concert Day event at the 2002 FIFA World Cup that was co-hosted by Japan and South Korea, and they agreed, but with the stipulation that they would only do so if B'z headlined with them. Ultimately, B'z and Aerosmith shared the same stage as the two bands performed hit after hit until finally the two joined forces for a rendition of the classic rock tune "Train Kept A Rollin'". The two would reunite over a decade later at AEROSONIC in Japan—a joint headlining venture between the two bands where they again joined forces for a performance, this time for the Aerosmith classic rocker "Mama Kin". On November 19, 2007, B'z received the honor of becoming the first Asian musicians to be inducted to the Hollywood RockWalk in Los Angeles, California. This was not the first time B'z broke new ground in the global music industry, however. In 1999, Tak became the first Asian guitarist to become a signature Gibson artist and has, ever since, sported and introduced to the public numerous Gibson guitars designed to his specifications—most of which have quickly sold out in their initial production runs. B'z have forged relationships with many of the top personalities in rock music, including guitar virtuoso Steve Vai, fellow American guitarist Stevie Salas, Slash of Guns N' Roses, Chad Smith of the Red Hot Chili Peppers, Juan Alderete of the Mars Volta, Pat Torpey, Eric Martin, and Billy Sheehan of Mr. Big, as well as Canadian drummer Shane Gaalaas and bassist Barry Sparks, who have become fixtures of the B'z touring crew as they tour in Japan and abroad. In 2010, Tak collaborated with renowned jazz guitarist Larry Carlton on an "east meets west"-themed instrumental album titled TAKE YOUR PICK, which would go on to earn the pair a Grammy Award for Best Pop Instrumental Album and make Tak the first Japanese guitarist to be bestowed with the honor. In addition to the artists listed above, B'z have worked with Brian Tichy, Chris Frazier, Denny Fongheiser, Jeremy Colson, Josh Freese, Robert Deleo, Sean Hurley, Andy Johns, and many others. 12. B'z "ULTRA Pleasure" Premium Live DVD (2008) — Included in limited edition of B'z The Best "ULTRA Pleasure"
13. B'z SHOWCASE 2007 -19- at Zepp Tokyo (2008) — Included in limited edition of B'z The Best "ULTRA Treasure"
1. B'z LIVE-GYM #001 "OFF THE LOCK"
2. B'z LIVE-GYM "BREAK THROUGH"
3. B'z LIVE-GYM '90~'91 "RISKY"
5. B'z LIVE-GYM '91~'92 "IN THE LIFE"
6. B'z LIVE-GYM Pleasure'92 "TIME"
7. B'z LIVE-GYM '93 "RUN"
8. B'z LIVE-GYM Pleasure'93 "JAP THE RIPPER"
9. B'z LIVE-GYM '94 "THE 9TH BLUES -Part1-"
10. B'z LIVE-GYM '94 "THE 9TH BLUES -Part2-"
11. B'z LIVE-GYM Pleasure'95 "BUZZ!!" 12. B'z LIVE-GYM '96 "Spirit LOOSE"
13. B'z LIVE-GYM Pleasure'97 "FIREBALL"
14. B'z LIVE-GYM '98 "SURVIVE"
15. B'z LIVE-GYM '99 "Brotherhood"
16. B'z LIVE-GYM Pleasure 2000 "juice"
18. B'z LIVE-GYM 2001 "ELEVEN"
19. B'z LIVE-GYM 2002 "GREEN ~GO★FIGHT★WIN~"
20. B'z LIVE-GYM 2002 "Rock n' California Roll"
21. B'z LIVE-GYM The Final Pleasure "IT'S SHOWTIME!!" 22. B'z LIVE-GYM 2003 "BANZAI IN NORTH AMERICA"
23. B'z LIVE-GYM 2003 "BIG MACHINE"
24. B'z LIVE-GYM 2005 "CIRCLE OF ROCK"
25. B'z LIVE-GYM 2006 "MONSTER'S GARAGE"
26. B'z LIVE-GYM 2008 "ACTION"
28. B'z LIVE-GYM 2010 "Ain't No Magic"
34. B'z LIVE-GYM 2017-2018 "LIVE DINOSAUR"
2. B'z SHOWCASE "GO! GO! HEAVEN"
3. B'z LIVE-GYM '99 -Brotherhood- SHOWCASE "B'zepp"
4. B'z SHOWCASE "Kobushi wo Nigire"
5. B'z SHOWCASE "SAPPORO DEVIL"
6. B'z SHOWCASE 2003 "IT'S SHOWCASE!!" 7. B'z SHOWCASE 2003 "BIG MACHINE"
8. B'z SHOWCASE 2005 "Abashiri Extra Edition"
9. B'z SHOWCASE 2006 "Yokosuka MONSTER"
2. B'z LIVE-GYM Pleasure'92 "TIME"
3. B'z LIVE-GYM Pleasure'93 "JAP THE RIPPER"
4. B'z LIVE-GYM Pleasure'95 "BUZZ!!" 5. B'z LIVE-GYM Pleasure'97 "FIREBALL"
6. B'z LIVE-GYM Pleasure 2000 "juice"
7. B'z LIVE-GYM The Final Pleasure "IT'S SHOWTIME!!" This page was last modified on 24 June 2018, at 07:05.